Business- and legal management with emphasis on organizational structure, human resource management and commercial law. Diplom Ökonom (Graduate Economist, equivalent to MA, 1994) and LL.M. (Com., 2011). 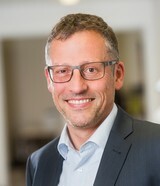 Michael graduated in Economics at the University of Bochum and began his professional career at the Institute for Environmental Protection, University of Dortmund. Right after the foundation of BICC in 1994, Michael joined the institute; in 2001 he took over the full responsibility for all financial and organizational issues. As one of Michael’s main fields of interest is the overlap and interplay of economic and legal issues when organizational and administrative structures and procedures are to be implemented and/or adjusted, he completed a second degree in Commercial Law while working. Since September 2012, he is acting Managing Director for Administration. He plans, directs and coordinates all administration and financial services for the full portfolio of our work. He thereby ensures that the operational capabilities are in place to sustainably support our mission and mandate. Together with the Director for Research, he is responsible for business development as well as for national and international cooperation and project acquisitions.